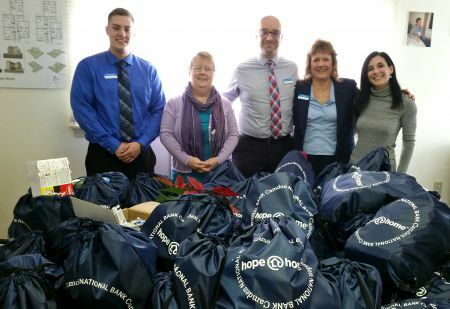 In coordination with its Hope@Home initiative, the Bank created the Hope Kit collection drive as another means to raise awareness around the issue of homelessness in Maine and provide assistance to the state’s homeless population and the shelters and organizations that support them. 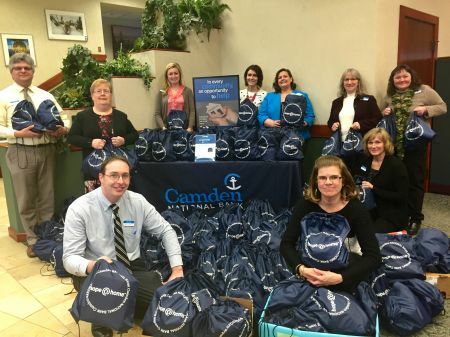 Camden National Bank worked with these organizations to identify some of the most urgently needed items for individuals and families, both sheltered and unsheltered, in area communities. Items included toiletries such as toothpaste, toothbrushes, soap and deodorant; personal items and necessities such as hand and foot warmers, bandages, antibacterial wipes, socks, and winter hats, scarves and gloves; and non-perishable, high protein food items like energy bars, trail mix, peanut butter, instant soups and cereals, and beef jerky. 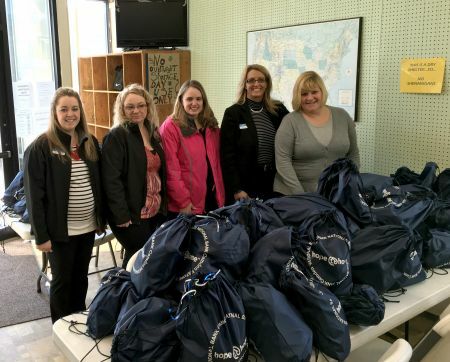 In the Midcoast area, more than 300 kits were distributed between the Hospitality House in Rockport and New Hope for Women in Rockland. Braun added, “To Camden National Bank and everyone who contributed to the Hope Kits: Thank you for bringing awareness to this issue, not minimizing it. Thank you for expressing an understanding of the prevalence of this problem, not denying it. Thank you showing that you are part of a community that supports and empowers one another. In the Bangor area, more than 200 kits were donated to the Bangor Area Homeless Shelter, and in the Downeast region, kits were delivered to Emmaus Homeless Shelter in Ellsworth and Next Step Center in Machias among others. In Southern Maine, donations were delivered to the Preble Street Teen Center in Portland, Tedford Housing in Brunswick, York County Shelter Programs in Alfred, and other local community organizations. Central Maine contributions included donations to the Bread of Life Shelter and the Augusta Community Warming Center in Augusta, the Mid-Maine Homeless Shelter in Waterville, and Trinity Jubilee Center in Lewiston. Through the community-based, statewide Hope@Home program, Camden National Bank donates $100 for every new home it finances to a local homeless shelter in the homeowner’s name. In 2015, the Bank raised over $44,000 for Maine’s homeless shelters. To view a video recap of the Hope@Home initiative and the recent Hope Kit collection efforts, go to https://youtu.be/JJKNOgAnaUY. For more information on Hope@Home or how to join Camden National Bank’s efforts to help Maine’s homeless individuals, children and families, please visit our Hope@Home page. Camden National Corporation is the holding company of Camden National Bank and Acadia Trust, N.A. Headquartered in Camden, Maine, Camden National Corporation has $3.7 billion in assets and is the largest publicly traded company in Northern New England (NASDAQ: CAC). Camden National Bank is a full-service community bank that employs over 650 people, features a network of 64 banking centers and 85 ATMs in Maine, and offers state-of-the-art online and mobile banking resources as well as brokerage and insurance services through its division, Camden Financial Consultants. Acadia Trust offers investment management and fiduciary services through its offices in Portland, Bangor and Ellsworth. To learn more, visit www.CamdenNational.com.